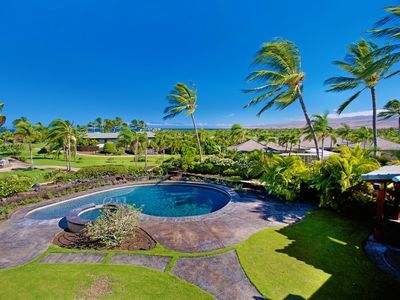 Your Island Paradise Awaits You! 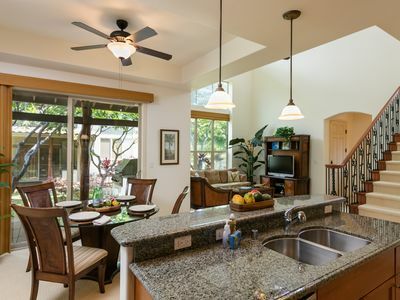 Feel right at home in our spacious 1700 square foot, 3 bedroom, 2 1/2 bath Villa with an attached garage. 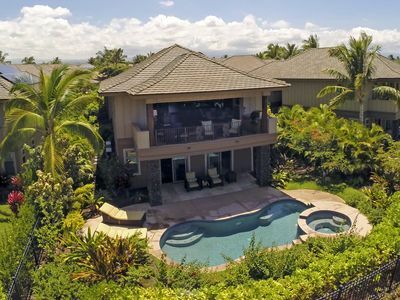 This beautifully decorated Villa is just steps away from the resort style pool featuring a lava rock waterfall, Jacuzzi spa, and 4 BBQ's for grilling your favorite local island fish. Whether you enjoy a game of tennis or working-out in the air-conditioned gym, Colony Villas has all the amenities you need. The fully equipped kitchen is a chef's delight with granite counter tops, high-end appliances, including a refrigerator with 2 ice makers! Everything you need to prepare meals for family and friends. 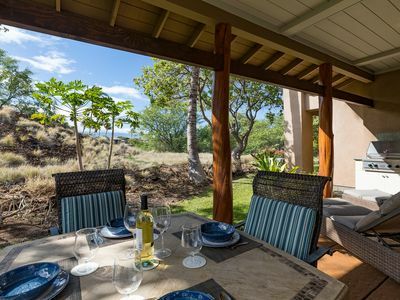 The dining area offers seating for 8 overlooking the lanai. 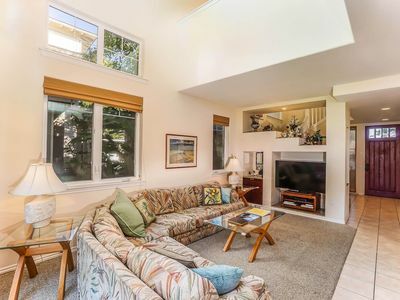 The spacious, main living area features 19 foot cathedral ceilings. 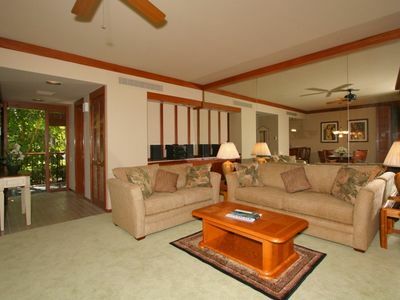 Set in a beautiful resort but with no one above or below, it feels more like a home. 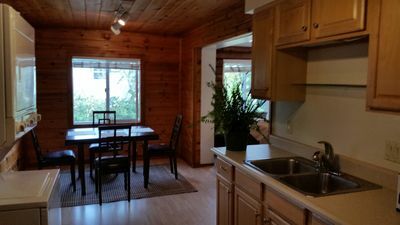 The main living area features a 55 inch flat screen, smart TV, DVD player, stereo system, free Hi-Speed WIFI, and newer carpeting. 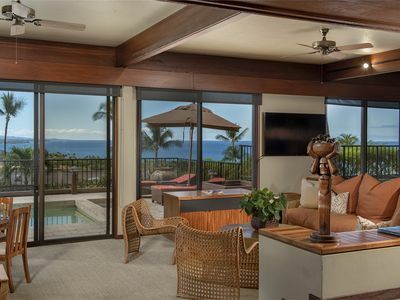 The sliding glass doors lead out to a tropical paradise with a covered lanai, overlooking the 10th green with additional dining for up to 6 guests. Making your way upstairs, you will find the master bedroom featuring a king sized Tommy Bahama bed and a walk-in closet. The spacious master bathroom has just been renovated to include granite counter tops, dual sinks, and a beautiful walk-in shower. 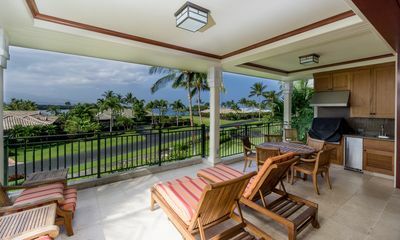 Wake up to serenity in the morning with your cup of "Kona" coffee overlooking the 15th hole of the Waikoloa golf course off the master balcony. The first guest bedroom is decorated in a tranquil ocean theme with a queen bed, mirrored closets, and a flat screen TV. 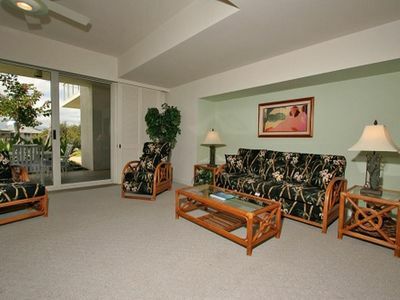 The second guest "Hawaiian" themed bedroom, also with a flat screen TV, has two twin beds. The guest bedrooms share a full bathroom with updated quartz countertops. A washer/dryer is in the hallway for your convenience. 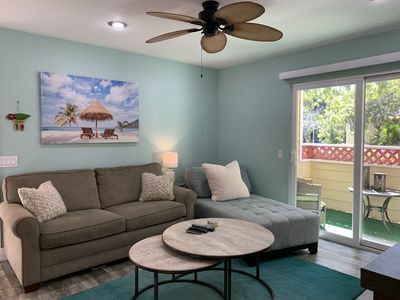 In the attached garage is snorkeling gear, boogie boards, beach chairs, and coolers to make your days at one of the nearby, beautiful beaches fun and exciting. An additional reserved parking spot is also included. 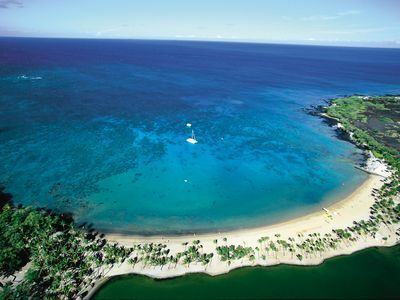 Waikoloa Beach Resort is known for having some of the best weather and beaches on the Big Island. 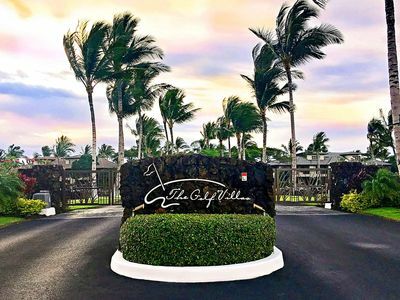 With over 340 days of sunshine and year-round temperatures between 68-86 degrees, the resort area offers world-class golf, dining, shopping, snorkeling, and diving. For the adventurous types, take a Blue Hawaiian helicopter ride and view the Big Island and its spectacular waterfalls. 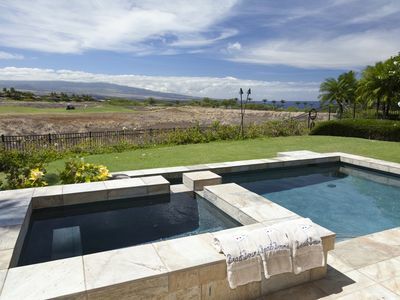 Swim with the dolphins, star gaze on Mauna Kea, or take a drive to Volcano National Park. 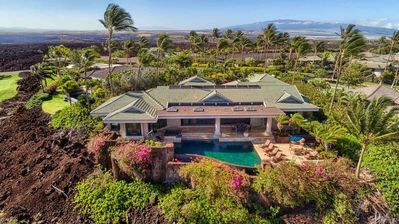 Spend the day snorkeling or swimming at the Hilton Waikoloa, or bask in the sunshine at some of the highest rated beaches like Hapuna, Mauna Kea, or our favorite for boogie boarding: Kekaha Kai which is just a short drive away. 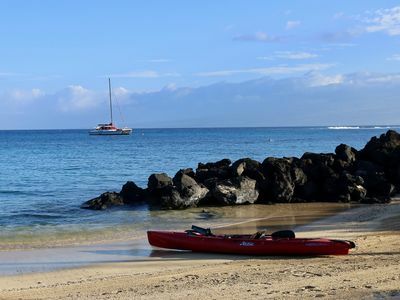 Less than a two minute drive is Anaehoomalu beach “A Bay”, where you can rent kayaks and paddle boards, snorkel or just relax on the beach. The bar and restaurant, Lava Lava, is there, where you can enjoy live music and a Mai Tai while watching the beautiful Hawaiian sunset. Should you need anything else, the King and Queen shopping center is just around the corner. 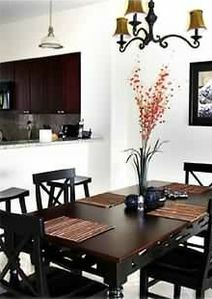 There, you will find fine and casual dining, clothing, boutique shops, and a grocery store. Feel like you need more relaxation and a little pampering? Spend the day at one of the luxurious spas. 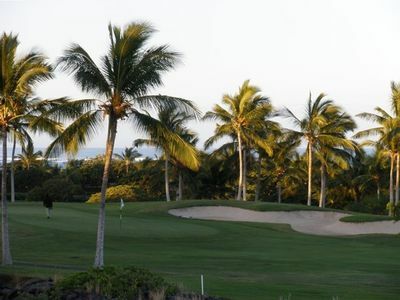 The Waikoloa resort area has so much to offer! 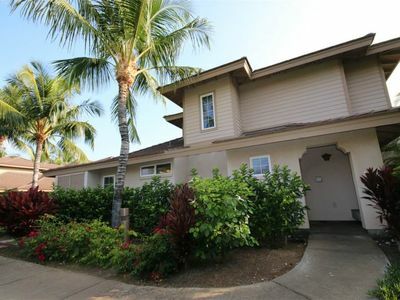 Nice 4bdrm Home w/Pool! Sundeck offers Great Sunset Views! Golf Villa with Ocean View! Reduced Rates & Green Fees! 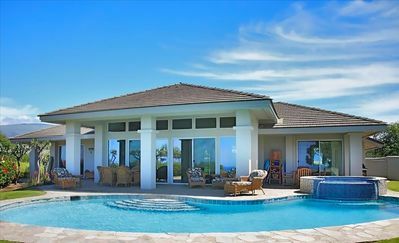 3 Bedroom Home with Pool, Sleeps 8! 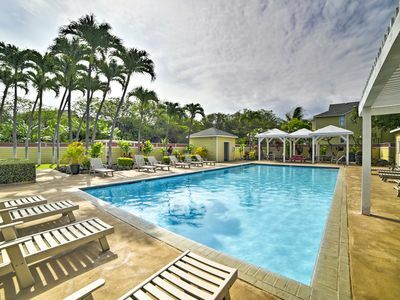 Welcome to Sea Star Place!!! !